Police reported Friday that the tractor trailer driver involved in a multi-vehicle wreck on Tidewater Driver in Norfolk VA may have had a medical emergency that caused the accident. The tractor trailer driver was found unresponsive in the cabin of his rig, and he was pronounced dead at a local hospital. Police state that the truck driver was going south on Tidewater Drive in Norfolk, when the truck suddenly went over the median and went into the northbound lanes. The truck smashed into two vehicles, which caused a chain reaction wreck. A total of seven vehicles were involved in the crash. Other vehicle drivers and passengers suffered injuries, although they were not thought to be life threatening. We are sorry to read that the truck driver in this case died when he suffered an apparent medical emergency. Our Virginia and North Carolina personal injury lawyers often see terrible crashes between big rigs and cars that cause serious injuries and deaths. People who are in an accident with a commercial truck should consult with an experienced personal injury attorney in their state; in some cases, the truck driver may claim to have had a medical emergency but this is not always so. 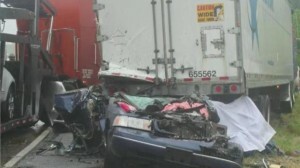 One of our truck accident clients in Virginia was in a car that was rear ended at high speed by a big rig. The car was basically run over by the truck. The driver claimed that he had a medical emergency, but our investigation showed that the man had no medical problems that were known to his trucking company. Most likely, the commercial truck driver fell asleep behind the wheel. The wreck was so severe that the rear of the car was completely crushed, and the front seats collapsed to the back. The two children in the back seat suffered substantial brain trauma that led to a multi-million dollar structured settlement.